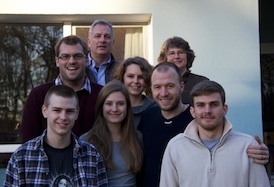 Paul and Jan minister near Berlin where Paul teaches in a biblical training center and leads a summer camp for young people under the auspices of Word of Life. Paul is also a talented trombonist and is part of a traveling brass ensemble that presents evangelistic concerts. Jan leads women’s Bible studies in their home. They have two adult daughters, Leah & Katie, who live in Troxler’s previous location near Munich, Germany. Their two younger sons, Michael and Josef, still live at home.